Don’t Snow Your Customers Out! Home/Blog/Don’t Snow Your Customers Out! Instead of hiding in your business until the snow and ice go away, actively go after your customers. 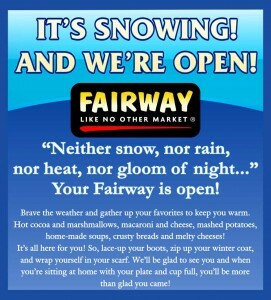 A friend sent me this photo from Fairway which says it all. I love the sign, “It’s Snowing! And We’re Open! Smart and neighborly. 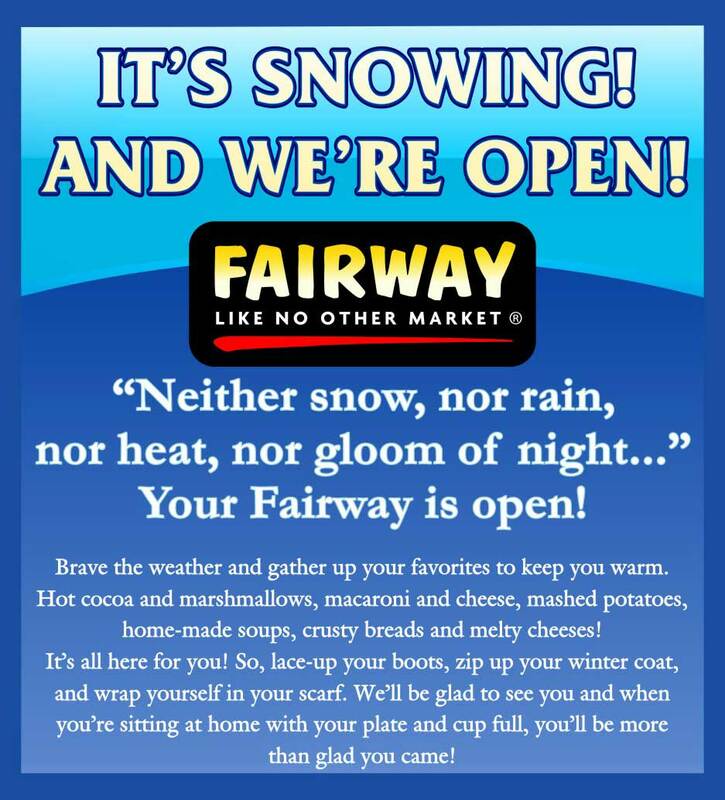 My friend Tony loves Fairway for just this reason and we always make a stop when we’re in New York City. Imagine, a stop in the supermarket! But he’s right it’s worth a visit. By the way, many of the foods are kept in “cold areas” so they have coats for the customers! I’m hooked too. This is also the time to get some free publicity from the radio and television stations. Let them know you’re open to help. Yesterday the Atlanta jail kitchen cooked up food for those stranded at the Trailways bus station. Sure it was part of the emergency services but it’s still interesting and newsworthy. The question is, how can you help out and try and do some business? In times of crisis you and your business can shine. Just go do something. Last week I opened my door after a huge snow storm and someone had shoveled my steps. In Albany, New York, you are required to shovel the sidewalk in front of your house or be fined. This morning while shoveling out my car I decided to clear the snow off the car behind me. Why not? I would do it more often but I don’t always have enough energy. Declare a “snow cookout” and serve hot dogs, hamburgers or marshmallows grilled outside in front of your store. I remember in the late 80’s, when my sister and I owned a store in Hudson, New York, this is exactly what we did. We put the grill in front of the store and stated grilling! It was amazing how thankful people were for a hot dog and a hot cup of coffee; especially the snow plow operators. By the way, you don’t have to wait for a catastrophic event to do some cooking in your parking lot. Post the photos on your Facebook page and invite your neighbors to stop for a visit. Retailers have told me this can have negative effects; that instead of feeding customers they are feeding the homeless. Does it matter who you feed? It’s a wonderful gesture and will certainly make you and your employees feel better while waiting for a possible customer. If you manage to get a customer shouldn’t they be treated to something? Have a “snow and ice sale” for the next week? I remember a flooring store in Cleveland that would seriously flood once a year; I guess you would say it was a bad location. It was a perfect opportunity for a week long sale. Call the local TV station and tell them you have hot, coffee/chocolate/tea for all emergency people in the area. Maybe you can give away blankets, coats or in someway help out. Neighbors helping neighbors. McDonald’s in Atlanta has been open for all the emergency agencies and are getting free public announcements. This is the perfect time to “pay it forward.” If you haven’t seen the movie Pay It Forward, this is a good week for it. Happy shoveling! I know of a retailer who already does the grillin’ in the middle of winter – DeGraaf Interiors in Hudson, MI grills winter or summer. I think it’s a great idea and one I’m sure their customers appreciate. Also, last night I was watching the Philadelphia news and the reporter was marveling at how many people braved the snowy conditions to stop in at Wawa just for a cup of coffee! Retailers should realize consumers suffer from cabin fever during these long, cold winters. If I hear someone’s serving hot chocolate with marshmallows, I may just venture out just to get out of the house. Finally, if you read today, currently 49 states have snow on the ground! How long ’til Spring? Hope you found your way back to Albany! Great blog! One of the coolest lil’ treats I’ve experienced so far is a local print shop here in Albany, Camelot. They bake cookies in the shop for every customer. It always smells yummy coming in (much better than over-heated printers and ink) and smells even better coming out! They do this year-round. They even drop a bag off for deliveries as well. I love your comment Tabby; that is definitely cool. You’re right better than over-heated printers and ink. Is that the smell in printers? Hey Caren, that’s great. I love the Wawa–I just love their name. Cabin fever takes hold this time of year so I’ll look for you anywhere they’re serving chocolate and marshmallows. Hey have I heard that Talkfusion is getting ready to announce video conferenceing and other cool stuff?